What could be better on the first Monday after Christmas, with no work, and a visit to the National Constitution Center to see the “Diana” Exhibit, than to top it off with some good Malaysian-Thai food at a center city BYOB that just happens to specialize in that very same ethnic cuisine. 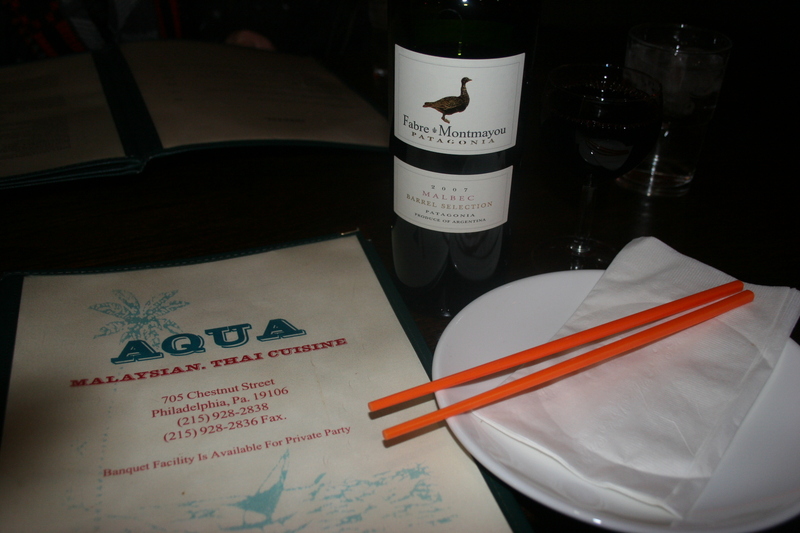 Aqua, at 705 Chestnut Street, was a welcoming refuge from the chill of a late December evening. My wife, Kathy, and I were dining alone this evening and we both were hungry following a long day of playing tourist in the city. I had brought a bottle of the 2007 Fabre Montmayou, Malbec, from Patagonia with me and it’s a wine we both have enjoyed in the past. 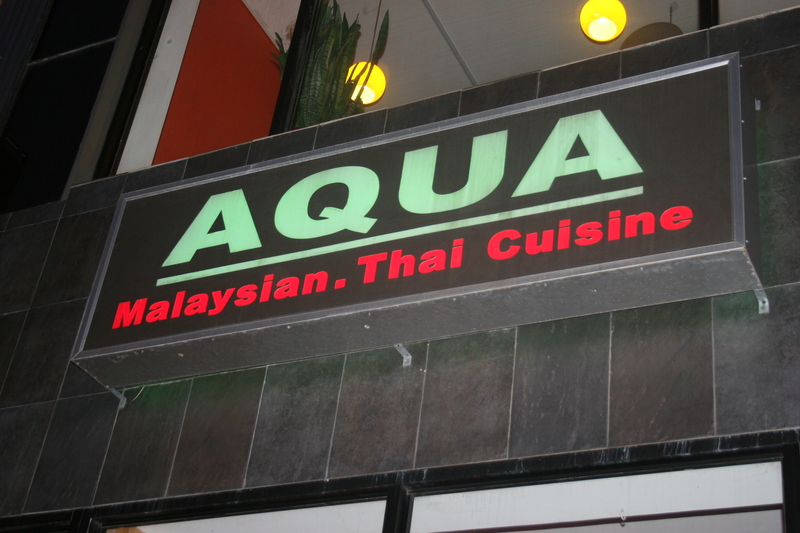 The menu at Aqua is lengthy with lots of interesting choices. Fortunately, I had read some reviews online before our arrival and there were a few items I was interested in trying. 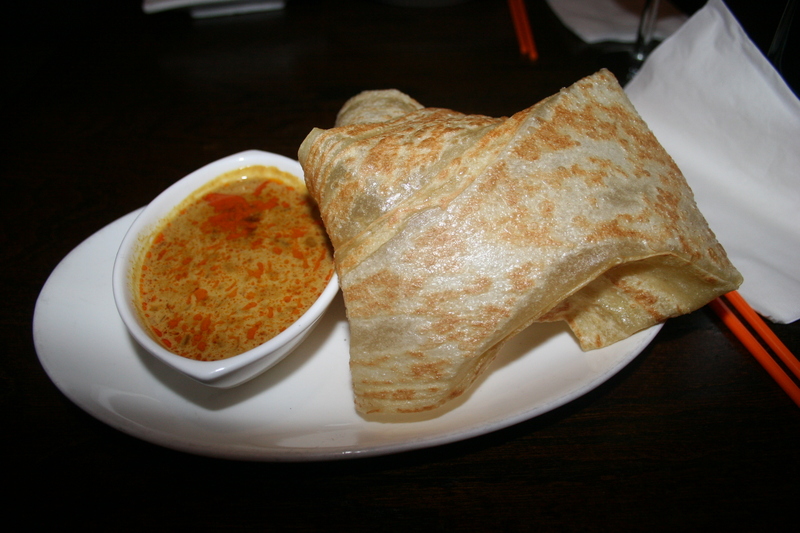 We both had appetizers; mine was the Roti Canai, crispy Indian pancakes served with a potato curry. They were very good and helped set the tone for the rest of the meal. 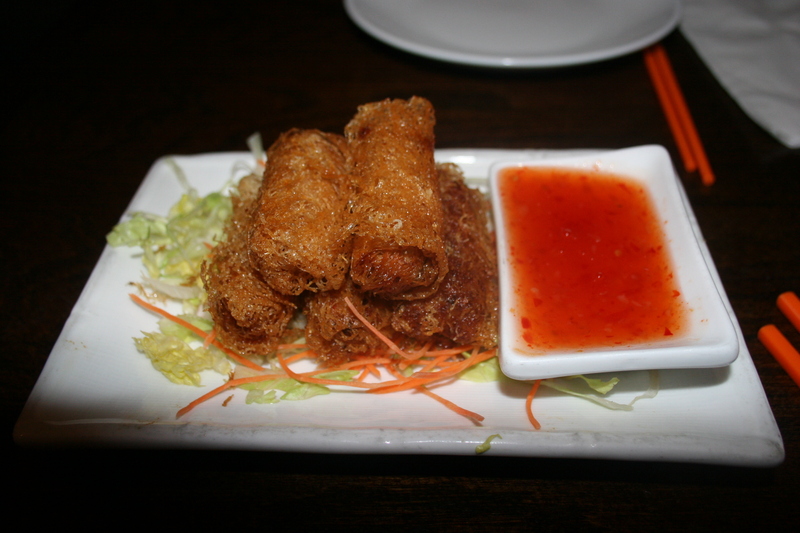 Kathy had Rice Net Spring Rolls, crisp spring rolls (five) filled with shrimp, crab meat and onion with a taro crusting served with a tangy plum sauce. It was all I could do to get her to part with one. She thought they were delicious. They were! Sometimes the unique blends that make up Asian cooking are just what you need to break up the familiar pattern of American food. Tonight that was truer than ever. We were anxiously looking forward to our main course. 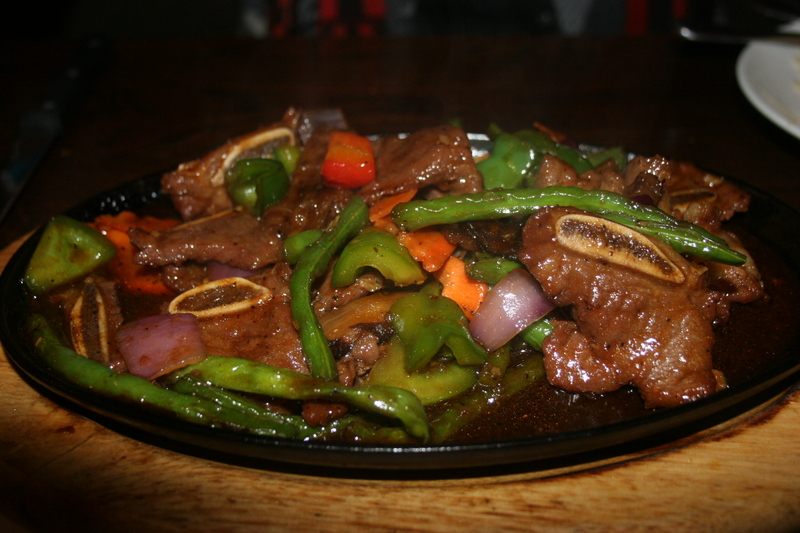 Kathy had chosen one of the evening’s specials, Sizzling Short Rib, sauteed, marinated short ribs with onions, peppers and eggplant in a spicy soy sauce served on a sizzling platter. The food was so hot she had to wait for it to cool to an edible temperature. She liked the spiciness of her dish but would have preferred the short rib to fall easier off the bone. 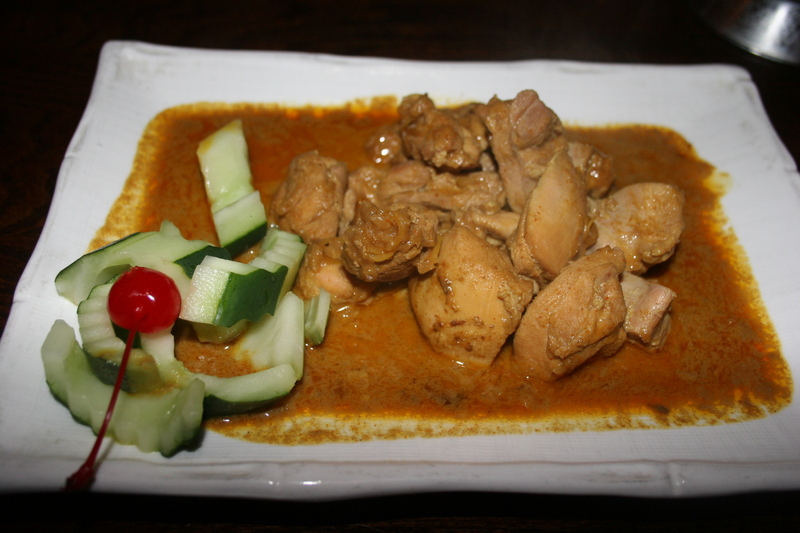 I opted for the Kari Ayam, chicken cooked over low heat with lemon grass and chili paste and simmered in thick, rich curry sauce served with cucumber. I thought the chicken was wonderful, the sauce intriguingly good and thoroughly enjoyed the meal. 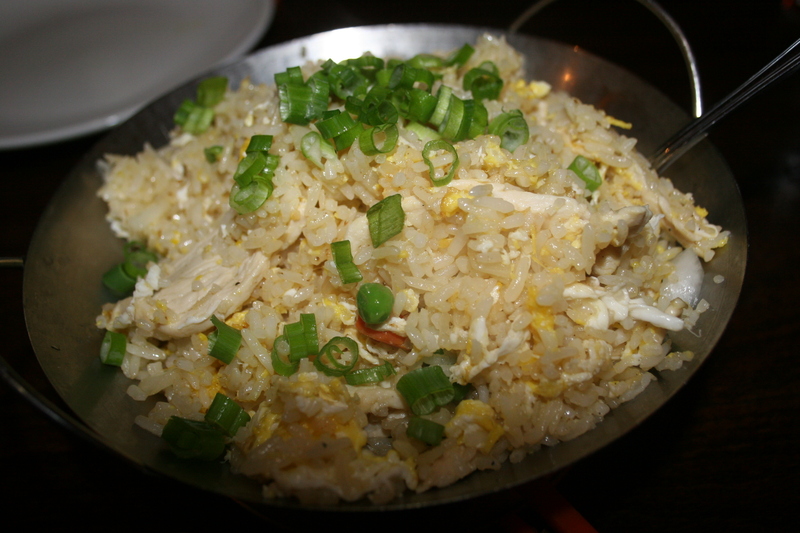 We had both ordered the chicken fried rice to go with our entrees and we were glad we did because this dish proved to be the perfect complement to the meal. Big tender pieces of white meat chicken were generously interspersed between the tender rice and veggies. Our hostess was terrific and made sure we had everything and kept our water glasses constantly filled and Vickie, the manager of Aqua, spent considerable time at our table and the others making everyone feel like more than just a visitor to Aqua. The meal was topped off with a yummy dessert, compliments of the house; a tasty version of the same Indian pancake that I had as an appetizer, but this time, baked and buttered and covered in coconut paste with a generous portion of coconut ice cream. It was GOOD!! There are scores of good BYOB’s to choose from in center city Philadelphia and AQUA, in my opinion, is right up there with the best of them. Good food, nice people in a welcoming environment; what more could a hungry diner ask for?